With their numbers proliferating like rabbits, it’s a little tough to choose the best crossovers 2011 – but we’ve done our best and arrived at the following five contenders. They span compact to midsize, and affordable to entry-level luxury makes and models. 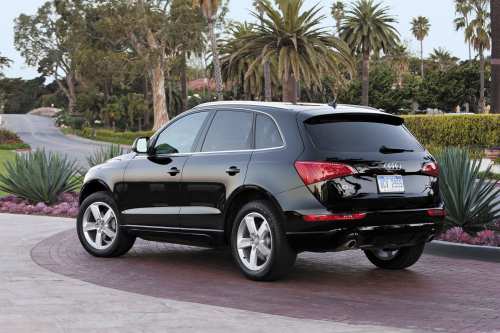 the 2011 Audi Q5 drives like a sports sedan, has a new 2.0-liter turbocharged or 3.2-liter gasoline engine, and standard AWD. Kelley Blue Book remarks: “The stylish and substantial exterior design speaks for itself. The interior oozes with both style and quality. The drive is comfortable and/or exhilarating, depending on your mood. The 2011 Audi Q5 is the category’s gold standard, and our current favorite.” Audi Q5 carries a starting MSRP of $35,200. BMW X3 – All-new for 2011, the BMW X3 wows on all fronts. Automobile says, “The new X3 finally has exactly what it needs to be a strong, possibly dominant player in the expensive compact crossover class.” Standard AWD, comfortable rear seat, new eight-speed automatic transmission, 240-horsepower 3.0-liter inline six-cylinder engine or 300-horsepower 3.0-liter turbocharged inline six-cylinder, and zippy handling are just a few of the X3’s highlights. MSRP begins at $36,750. Cadillac SRX – The midsize 2011 Cadillac SRX is smooth riding, stylish, has great safety ratings, terrific performance with the turbocharged engine, and available AWD. Jalopnik observes: “The new SRX is good, really good. Lexus RX350-beating good. For a segment which has traditionally isolated the driver in a cocoon of leather and glass and over-damping, the SRX actually makes driving part of the equation.” Base MSRP for the 2011 Cadillac SRX is $34,430. 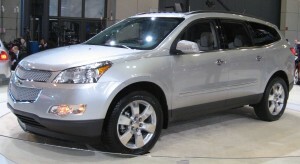 front-wheel drive or AWD, four trim levels, comfortable third-row seats, plenty of cargo space, and good fuel economy (17 mpg city/24 mpg highway) for its size, the 2011 Chevrolet Traverse is perhaps an unbeatable value. Kelley Blue Book remarks: “If you’re looking for a big family vehicle with excellent safety ratings, the ability to tow 5,400 pounds and reasonably good fuel economy for its size, the 2011 Chevrolet Traverse may be the best game in town.” The base FWD Traverse starts at $29,224, while the AWD model begins at $31,224. Top-of-the-line LTZ models begin at $38,105 (FWD) and $40,105 (AWD). Three more to consider for best crossovers 2011 include the Honda CR-V, Kia Sportage – all-new for 2011, and Mitsubishi Outlander Sport. For another upscale choice, take a look at the Infiniti EX.